Another thoughtful article Erik. But there’s something about that I have to disagree with. Throughout, you seem to make the argument that anything other than a traditional or mainline form of worship is, by default, not liturgical. 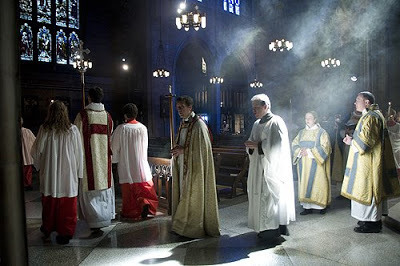 As you know, I’m not a self-described ‘liturgy geek’, but I do know liturgy. The word itself means ‘work of the people’, so really, any ordered worship experience is liturgy. The non-denominational church down the street with drums and projection screens is strictly liturgical if they have their songs, scripture reading, prayers, and sermon in the same order week to week. And, to be honest, I’ve never been to a church that doesn’t follow an order like that week to week. I’ve never been to a church that started with a sermon and ended with a call to worship. I agree that there is something about the repetition and the rhythm of liturgy that speaks deeply to people’s faith. I agree that there is a comfort to knowing what comes next. But traditional liturgy is not the only liturgy. The people who gather together to worship should find their own voice as to how to enact that liturgy. For some it will be high-church traditional mainline worship. For others, it is guitars. For some it will be a new version of the historical language and ritual that has been passed down through generations of Christians from the early church. That is in fact how many churches are trying to be who they are. What I do wholeheartedly agree with is that, whatever liturgy you follow (or lead), do it well. Thanks for the comment Jason! And I would agree with what you say about the ordos or liturgies of other traditions, and I am certainly not trying to say other orders that some churches follow are not valid. ‘The Liturgy’ that Christians have been using since the 1st century, and the texts and that we have been using since 3rd or 4th century is what I am talking about when I say “liturgy”, but I would totally agree that it is not the only order out there. I don’t want to make this about The Liturgy vs. “Non-Liturgical Worship”, although I know some are reading my post that way given comments on Facebook and twitter. I am more concerned about the meme or narrative among mainline liturgical folks that “non-liturgical” is what young people want, or Nickelodeon liturgy is what we young people want. I don’t know of too many Lutheran congregations that are going to do Mennonite or Baptist liturgy very well, and vice-versa. It doesn’t mean we can’t learn or borrow from each other, but we can’t forget where we come from. 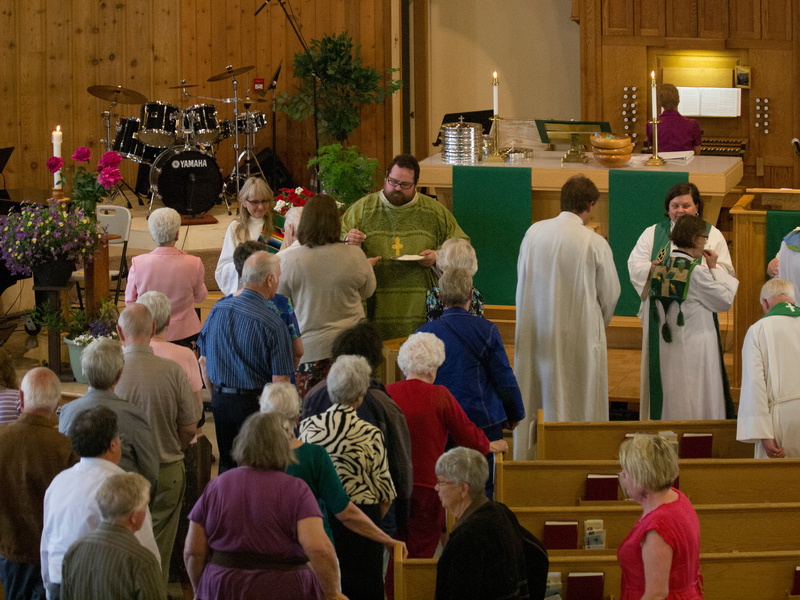 I would like a lot of Lutherans to do their liturgy well before expanding to add other elements. Just for some context, I’m a millennial Tech Arts pastor at a medium/large Independent Baptist church that is in process of beginning my path towards the Anglican Church. 140 million Charismatic Catholics would suggest that you can have both in an authentic way. I can’t say that I know much about Charismatic Catholics, maybe you could say more about having “both”? Not sure I am following. Broader than just Roman Catholicism. There is a tradition which brings together the fullness of sign and symbol with contemporary or folk musical expressions. That brings the assured supernatural action of God in the sacraments with ecstatic supernatural action of God by the Holy Spirit. High Mass with prayer ministry and space for spiritual gifts and a worship band. Not saying it is ‘better’. Just that it is there as a meeting space between different expressions. I had a friend in bible college that became a Charismatholic. It always sounded intriguing to me. I’m a Wesleyan minister that was a lay-minister in the ACoC before that. I never had any problems with the liturgy, although there were times that the choral performance centrism rivalled any worship band focus I’ve seen in Evangelical churches. The issue I parted ways with them on was theological. Most mainline churches tend to swing more liberal than I’m comfortable with. Then again, while I’d enjoy coffee with RHE, we’re never going to see eye to eye theologically. I was only in the Anglican church for 3 years, but 5 years since I moved on, I’ve still got the kyrie and gloria in my head. Interesting reading this one, as some one who was brought up on set written liturgy for every service, yes I can recall large chunks from memory. However it has also led to me being able to led extempore prayers – and especially the Great Prayer of Thanksgiving – as I have been well marinaded in the words. Just thinking as one millennial to another. Hmmm… Interesting. We had a seminary professor who could do this very well, he would compose Eucharistic prayers as he went, and they contained all the essential elements. He could do this because he knew the liturgy not just by wrote, but the structure, very well. I agree on many levels, as a fellow liturgy-supporting Millennial Lutheran. I would just take a minor exception to the implied notion that liturgy shouldn’t change (“the familiar Kyrie and Gloria, which are the same week after week”; “words passed on to me from generations before”). Lutheran liturgy has many “official” settings, and my church uses some beautiful settings that borrow from traditions around the world. The order, format, and ideas are the same, but it’s different tunes, different words, and different ways of expressing the ideas that are rotated on a seasonal basis. To me, that’s an important way to keep things fresh and prevent each Sunday from being something you do from memory and never think about. Thanks for this….encouraging to this Anglican Priest. I’ve been preaching this for years. Young people crave mystery and a sense of something larger than themselves. We all spend all week looking at a screen and with our ear buds in. The last thing I want, and many want in church is another hour with badly run technology. Your article is really interesting. I am a little bit ahead of you in age. My whole life I have been ping-ponging back and forth between high liturgical worship and non-liturgical worship. I’m a UM PK, so my dad’s style of worship was what I grew up with. He preferred a relaxed liturgical format. In high school I became involved in a large non-denom mega church (early 90’s). It was devoid of religious symbols and had no common liturgy. I found it refreshing at the time. However, by the time I got to college and on my own, I started to long for the seasons of the church to be recognized. So I spent Advent and Lent in high liturgical churches and the rest of the year I would attend non-liturgical churches. As I entered Seminary, I started to be drawn more and more into liturgical worship. I was fascinated with the history and the rhythm it provided to the service and to the year as a whole. The more I learned about ancient liturgies the more I became consumed by them and I started to introduce them to my churches. I went through 3 appointments of decent tenure with this mentality. This reached its pinnacle when I went to Wesley for my D.Min. and spent morning and evening every day at the National Cathedral for three years. Then most recently I was appointed to a start a new congregation within a church that was intended to be non-litrugical. I was confused as to why I was being appointed here, but I followed God’s lead. Since we have launched this congregation I have rediscovered non-liturgical worship and my heart has fallen in love again with the freedom, the opportunities for individual expression, and even the neo-liturgical order that enters into a service like this completely unbeknownst to everyone involved. The thing is, when it comes down to it, I am in love with both styles of worship and I am never completely satisfied in either, and least satisfied when blending is forced. A perfect Sunday for me is being able to experience quality high liturgical worship then enter into another worship experience that is free flowing, and allows me to individually encounter God. As a pastor however, I don’t see the numeric evidence that liturgical worship is drawing in younger folk. Oh, sure, every now and then, but on the whole I’m looking out a an aging group of people that will not be present in 15 years. How do we change that? In the end I don’t believe its much about style of worship. Its a hell of a lot more about relationship and I still don’t think we have figured that out yet. Dealing with you last point, I think that relationship have to do with accepting who we are as individuals and congregations. And no isn’t necessarily about style of worship, but as I said in the article if we worship like we are apologizing for who we are and think that people will only come if we become something else, we have a problem. I’m older than you, but it was in college I began attending an Episcopal church. It felt “safe” to me, in ways that previous Evangelical churches were not. I loved the liturgy and the timing. I loved that I knew what was coming next, and frankly I saw it as a much more balanced church than others I had known. My experience with churches with worship bands was that many of the pastors seemed to have the attitude of, “Let’s get this stuff over and out of the way so you can hear what I have to say.” In a liturgical service, “this stuff” IS the service, not something to get out of the way. I’m talking past tense. Because of complications, my husband and I attend a Lutheran church. It fits us fairly well. Great pastor, wonderful congregation. I miss high liturgy. Reading the Gloria you wrote above, my head is instantly there, and finishing it. When we are able to attend an Episcopal/Anglican church, it is always coming home for me. Thank you for this. This type of story needs to be told. An Episcopal friend alerted me to this post on Facebook. This is spot-on. I belong to the largest parish in the ELCA Rocky Mountain Synod, Bethany in Cherry Hills Village, CO. We are in an interregnum right now, our senior pastor having left to head the big 25th anniversary fund drive for ELCA. And it couldn’t have happened soon enough., During his eight-year incumbency we went from MOTR Lutheran liturgical worship to happy-clappy and a large percentage of the membership left. We have a wonderful interim senior pastor and things have taken a dramatic turn for the better. Instead of “McDonald’s communion” where we only heard the verba but other elements were introduced into the service that were not liturgical but were accompanied by lots of applause, we’re back to weekly communion with full liturgy, even a short Eucharistic prayer. And the applause has virtually disappeared as we begin to rediscover the awe of worship in God’s house in the orderly, liturgical way and the people are truly involved in the work of the people. It’s ironic in a way because the church was torched by an arsonist in 1984 and was completely built new from the ground up following a design by a Roman Catholic architect that was a prototype for other similar RC churches. We have the best facilities for liturgical worship in the Synod, bar none, and a fantastic music program that is coming into its own once again. I’m hopeful that our choice for the next incumbent will be a pastor who has an appreciation and desire for high-church liturgy. And while I took a sabbatical from happy-clappy I met several millennial pastors who were into high-church liturgy with growing parishes who appreciated the mystical, the omnipotence of God and also understood the theology of the Cross. All that works together in my opinion. Thanks for this excellent piece! My late brother-in-law was a pastor in Towner, ND and we’d often drive up to Winnipeg for the day. I remember dinners of Lake Winnipeg goldeye — smoked as I recall. Maybe I’ll get up there again and we can meet for a beer of two. If you’re interested, our web site is http://www.bethany-denver.org. We’ve quite a ways to go but we’re on the road! If you are in Winnipeg it would be great to have a beer, indeed! Thanks for sharing this story! My last synod, the Synod of Alberta and the Territories has a good cross boarder relationship with the Montana Synod. After seeing Bethany’s website, the congregation reminds me of second parish! Seems like a happening place! And Denver is beautiful city, one of the few US cities I could consider living in. I, too, am an high-church millennial. I am also a liturgical nerd, and have extensively studied millennials. Millennials — as any demographic — are not monolithic; some love pumpkin spice lattes and some can’t stand Starbucks (I’m craving a PSL at the moment…). Anyone that attempts to say, “this will attract millennials,” doesn’t have a clue what they’re talking about. “This” might attract a segment within the larger demographic, but nothing will attract all millennials. I can tell you what attracts me: fullness. Worship — liturgical or non — is replete with signs and symbols of God’s redemptive power in the world. When worship leaders — lay & clergy — do not attend to giving these signs and symbols the fullness that they deserve, worship is worse than just vegetables. I’m United Methodist, but I’ve been church hopping recently to see what other congregations in my area are doing. I went to one ELCA congregation recently where the pastor, a very gifted preacher and public speaker, read the eucharistic liturgy in such a rushed and monotone voice that I can only guess that someone forgot to put any commas or periods in the text. If she had brought the joy and passion she used while preaching into the eucharist, it might have been one of the best services I have been to. I used to attend an ECUSA congregation. The key organizing principle under their liturgical practice was joy; as we gather around the table we celebrate and give great thanks to God for God’s continued engagement in salvation’s history. It was truly a celebration. It was full. Hmmm… Why do we worship? Not for self-satisfying liturgy or self-indulgent music. That’s for sure. It’s to give our whole hearts to the One who gave His all for us. In the entire article, there was not one mention of His name: Jesus. But that doesn’t exclude God meeting us in the service. Each person has a different comfort zone where God can touch our hearts. Part of the mystery we crave. I am not a millenial, but I’ve lately become interested in revisiting my Episcopal roots, having left the denomination thirty years ago. While I am not liberal enough to tithe to a liberal Episcopal church with its commitment to reproductive choice, etc., the service at the Anglican church I recently visited moved me to tears. The service was exactly the same as when I was a child, and I remembered every note and every word of the sung liturgy. It was spectacular. It was reverent. It was robust and joyous. For the majority of my life, I attended mainstream evangelical churches that were considered nondenominational. In my late teens I began to realize that I wanted something more out of worship, that the lights and rock and style that I had grown up with was not what drew me to church. Having no idea what liturgy was, I didn’t know what I wanted. In my sophomore year of college, I discovered the wonders of an Anglican service. Despite being very confused and a bit weirded out by my first time there, I continued to come. I eventually realized that the structure, historical connections, and I guess reverence is the word, was what I was looking for. I’ve now been at this little Anglican parish for about a year and was confirmed a few months ago. What I found at this church was what had been in a sense missing at the churches I grew up in. Thanks for this. It’s what I’ve been ranting about for ages as a fellow millenial-ish Episcopalian, now priest….I’ve lost count of the number of high church young liturginerds I met, but our numbers are many. And, you’re right, there’s no one form of church that appeals to all of any generation so you’ll always have your lovers of guitar mass, and of rock band mass (but even those defy generational bounds), and trad liturgy. The Church needs to learn not to ditch the old for the new. That’s what’s up. Having grown up in a southern state southern Baptist church I never saw the liturgical in any way shape or form unfortunately. To be sure my home church was traditional in the sense of rural Baptist worship – hymns, choir, organ, piano, sermon etc. and there was a type of liturgy though no one would have used that word. I to went through the contemporary mega-church thing and nearly bought into it hook-line-sinker and had it not been for a very sensible SBC brother who saw what was really behind some of that I probably would still be in that mode. Michael Spencer (aka The Internet Monk), who passed away several years ago, was probably the one person who really turned me back around to see a more liturgical approach to worship and really introduced me to the seasons of the church year, the idea of communion more than 4 times a year among other things. I knew deep down somewhere that I wasn’t satisfied with church as I had known it and the times I had been to liturgical churches I knew that there was a definite interest on my part and add to that my being an organist with a passion for the instrument and its music and the majesty of congregational hymn singing accompanied by the organ…… well the rest is history. The church I was playing at when I began to change my thinking on this was moving towards trying to become contemporary and I found that I was not the least amused with the idea and the pastor was not pleased with my reevaluation of worship either – needless to say I didn’t stay there very long afterwards. I’ve been fortunate these last couple of years to play the organ (nice 3 manual pipe organ) in a downtown Baptist church that follows the Christian church year/seasons and is much more traditional (sometimes liturgical) in terms of how worship services are done. While not the high church talked about in this very good article, it’s refreshing to know that there are still Baptists who know and have an appreciation for the more traditional/liturgical approach to worship and I’ve found that I’m not really interested any longer in the trendy mega church type of worship service. I will say that in my church we have seen a renewed interest by younger folks (millennials etc.) and think there is definitely a niche of folks of all ages who are looking for more traditional/liturgical type worship churches. Lastly, folks…..churches…… take seriously this one thing that was said in the article – please be who you are – what you are and quit trying to be like some other church in your town/city. Do what you do and do it well whether it is liturgical/traditional or blended/contemporary………quit trying to be something you’re not!! You might also be interested in novelist Anne Rice’s spiritual autobiography (Called Out of Darkness.). In addition to the compelling liturgy of the Roman Catholic Church, she was drawn back to the church by the visual images she remembered from her childhood, particularly the icons. I, too, can describe every single stained glass window from my childhood church, and the images provide as much comfort and joy as the liturgy. The visual aspect of worship made me feel like I was in a special place, set apart from the world temporarily. Today, the screens with high-tech videos and hymn lyrics make me feel like I am in a business meeting. Totally a liturgy nerd (but slightly older, as an X-er). I always have to take pains to explain that I don’t disapprove of praise and worship services–they just feel like a dessert to me without the meal. I enjoy the communal experience of chant and response and the sounds of the words. Glad to see that I am not the only one. Yes, for the Eucharist, there is a pattern, often described as GATHERING – WORD – MEAL – SENDING. This remains the SAME, but there are also VARIATIONS —- the “Gloria” or “This is the Feast” or another hymn of praise, a more penitential expression during Lent, great festivity during Christmas and Easter, the Nicene or Apostles’ Creed.. . . The OT Lesson, Epistle, Gospel, the Sermon, plus the specifics of hymnody are different every Sunday. Yes, I am liturgical and have written about it, but liturgy has BOTH sameness AND variety. I just hated youth group as a pk. Anything that smacks of it turns me off. As a Presbyterian we use liturgical elements loosely, but it’s enough to connect one with tradition. I wonder if young people who’s parents are all divorced are maybe drawn to the stability of liturgy and the fact it isn’t a cutting edge (20 years ago) experience that feels aimed at a different kirk cobain Jesus generation. I think the really thing though is we never should have let worship styles break our communities like it did. Most people that get uppity on it I have literally heard say things like singing makes me feel good but I don’t like the praying and preaching… Christian flunkies they are..
I’m with yah! I didn’t grow up with the Lutheran liturgy… I grew up PCUSA. (And I did a lot of church hopping in college, where I spent a lot of time in traditions with more charismatic and/or contemporary influences in worship, which I enjoy, too!) But I definitely have come to love the high Lutheran liturgy at the congregations in which I serve… And I’m finding that many of the youth and young adults I work with love it, too! Totally! So often our discourse on worship are about right or wrong. I think it is about worship we discover a new identity in Christ… Which may take many forms. Thanks for sharing! Pingback: Anglican mass. | Shine. Thanks for what you wrote. I feel like what you wrote. I’ve been telling people in my church we don’t need to change we just need to be ourselves. Liturgy is a trip to Grandma’s house. It is familiar. It is comfortable. It is timeless. It appeals to all. It is a memory of what is, what was and what will always be. It tells me that I am part of a never ending stream of life and worship. It tells me I am part of a never ending path of faith. It assures me that I am part of a universal family. Liturgy is not entertainment. It’s not dinner theater or stage show. It requires no musical accompaniment. Liturgy enjoins fellowship. Liturgy is love. Love the works of this creative blogger! Thanks, Pr. Erik! I am Father Vladimir Raasch. A former Roman Catholic, now Orthodox. My adopted brother, Fr. Wilbert Boerstler, an ELCA pastor ordained in the 50’s introduced me to High Church Lutheranism back when I was still a Roman Catholic. I simply fell in love with it. Later I came to love the Byzantine Liturgy even more, which is one of the reasons I became Orthodox and later was ordained a priest. But I am happy to see the very goals that my rbother fought so hard for, finally bearing fruit in the Lutheran church. Right now I am just “surfing” abd reminiscing by looking at the current web sites of some of the old pioneer High Church Lutheran parishes. Wow! Have their interior really changed! Yet, it is all for the better. Fr. Wilbert “Willi” is now in his 80’s and still going strong! He finds it hard to believe how far the Lutheran High Church tradition has come since those early years. I would like to correspond via e-mail with anyone reading this blog, who is an active High Church Lutheran, either clergy or lay. Let’s get in touch! I am from Minnesota, an old “low church” Lutheran bastion!